This past weekend Jeff and I went up to Michigan to visit my sister. While we were there, we went to a pet store called Super Petz. They had an awesome supply of bunny products!! Most pet stores around here don't really have very much (especially compared to the amount of cat and dog items!) I saw some orchard grass hay so I decided to buy some for Cocoa. I have just been feeding him timothy hay, but I figured he would like some variety in his diet! He definitely loves the orchard grass hay. He always gets really excited when I open the bag up! On another note, I came home from work yesterday and Cocoa's cage was trashed! I really wonder how he managed to knock his whole box over. 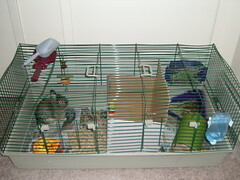 Here is a picture of how his cage looked. Yeah he likes the Orchard Grass. And I wish Cocoa a happy birthday!